Anytime the Phillies score as many runs as they did in the 8th inning of last night’s game, I’m going to inevitably think of what they did to the Dodgers on August 21, 1990. Since that game took place nearly 21 years ago, the Phillies have come back from bigger deficits and scored more runs in one inning, but they have never came back from as far down in the 9th inning as they did that night. Admittedly, the Fightins weren’t overcoming an right-run deficit last night, but come from behind wins with that many runs in an inning that late in a game don’t happen very often. This morning I took a look at the boxscore from the epic game that took place when Kruk, Daulton, Dykstra and Sil Campusano were on the roster, looking for a player whose card I should use as illustration for this post. While Carlos Martinez and Rod Booker would have been excellent selections based on their 9th inning contributions, the name that stuck out for me was Fernando Valenzuela. Even better: I had the perfect card given his role in the game. Now, the chances of my ever bringing up Booker or Martinez ever again, thus having the opportunity to display one of their cards, are incredibly slim, but Valenzuela’s role in the game, the fact that he would later go on to play for the Cardinals and Phillies, and the awesomeness of having just the right card to tie it all together were just too much to ignore. See, he entered the game as a pitch hitter for Don Aase in the 8th inning, got a base hit and didn’t return. It’s not as awesome as the time he came out to play the outfield for a couple innings during 21-inning Dodgers-Cubs slogfest in 1982, but it’s certainly up there in uniqueness. Having already touched upon the Phillies and Cardinals connections, Valenzuela’s 1995 Collector’s Choice Trade-In Redemption Card has a couple other things going for it. The first, and most obvious, is that it shows him with a batting helmet on. Admittedly, his Upper Deck card that year, which bears a photo that was likely taken on the same day as the one on the card shown above, depicts him swing a bat, mid-game for the Phillies. However, given the fact he played in only eight games for the Phillies and five for the Cardinals, using his Trade-In Redemption card (good for “11 NEW Collector’s Choice™ cards of the hottest players on their NEW teams,” according to the back of the card) just seemed like the right karmic choice for tying together last night’s game and the game from 199o that it made me think of. Interestingly, Valenzuela never appeared as a Phillie on any Topps issues, even though Fleer, Pacific and Upper Deck managed the feat. 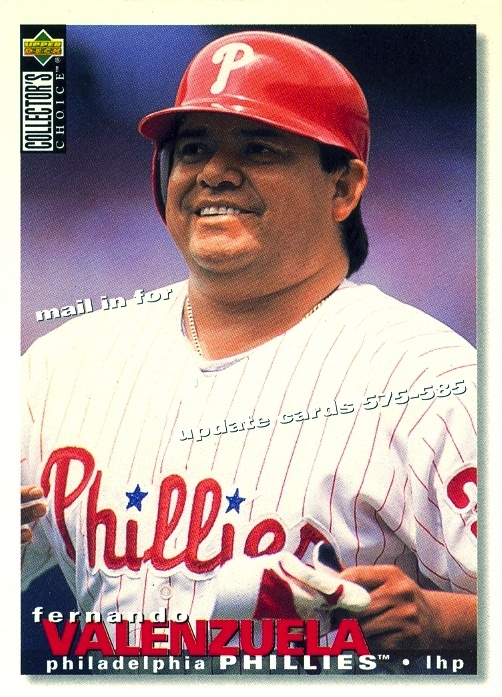 Sadly, the mid ’90s were the beginning of a nearly 10-year period in which Topps drastically cut the size of its flagship line, and many deserving Phillies never showed up on a Topps card during that period. I suspect that when Jim over at The Phillies Room finally gets around to his review of those Topps issues, he’ll have a lot to say during the “Who’s Out” segments.